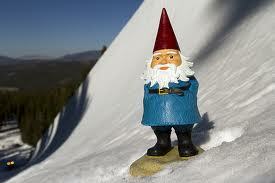 Travelocity has launched a social media contest that will award would-be travelers the trip of a lifetime. “Go & Smell the Roses” in a series of new advertising, digital and promotional efforts that encourage would-be travelers to actively dream about where they want to go. The new integrated campaign shows the best of The Roaming Gnome’s travel adventures and kicks off the #iWannaGo contest, enticing consumers to tell the roaming gnome where they want to travel for a chance to win their ultimate dream vacation. The company’s famous (and almost too cute) Roaming gnome with appear in five new TV commercials to promote the #iWannaGo #gosmelltheroses contest. The spots will feature the gnome in a variety of situations, ranging from the running of the bulls to a ski gondola to a sandy beach, all with messages encouraging travelers to get up, go and experience. The campaign was created by Durham-based advertising agency McKinney. It’s on YouTube and seen in its entirety across all of the brand’s social channels including mobile devices. The company is aiming to attract travelers through a bunch of interactive and marketing methods, including a new video series with Courtney Scott, a “Let’s Roam” app launching in April that will let travelers use social sharing technology to solicit information about upcoming trips, and a billboard-like advertising program in major airports that will direct travelers to special offers through unique mobile codes. The contest runs through May 5, 2014. Contestants simply tell The Roaming Gnome where they wanna go by posting dream travel tweets, photos or videos on Twitter, Instagram or Vine using the hashtag #iWannaGo. Two winners selected at random will win their dream #iWannaGo trip, and will be announced via social media in April and May. This is a cool campaign for sure. Sadly I never try to enter anything like this because I never win. I suppose I should try at least, because there is a chance of winning. I just don’t feel like wasting my time. Anyways, I wish to see more contests like this. I would actually start entering them if they did them more often.